Once upon a time I wrote about the "value" or "service to the society" of the flipping activity. Now let's talk about the other main source of income: long term speculation. This activity can only exists if supply or demand change over time. This change changes the market price. The profit is the difference of the current price and the future price. This profit can be very high, and people tend to believe that we take this money from the "honest people". buyers have to pay more (average 75G) for each frozen orb before patch, so they lose 15G/orb. But produces can sell their orbs the same amount higher. buyers have to pay less (average 125G) for each orb after patch, so they win 20G on each orb. Producers can sell their orbs the same amount lower. So the sellers won/lost the same amount as the buyers lost/won. Seems like zero sum, so who lost the golds he won? Those sellers who did not wait with the selling and those buyers who did not bought it on 80, hoping that it will return to 60. So the primary losers are the dumb ones, and we don't cry for them. However there is more here: by elevating the price before the patch, more and more people started to adapt to the increasing price, producing more orbs than before. With the speculant the overall orb production increased, and it's a win for everyone. So the service of the speculant: forecasting the changes and setting the prices accordingly, so no one is surprised by them. Instead of a huge overnight change, there are several smaller changes over the span of weeks. His stockpiles are also forming a buffer, preventing flings caused by panicing people. This is a useful service, that's why all free countries allow it, and those who do not, having worse economy. Between collecting orbs during instance runs and buying them on the cheap I did have a nice supply ready. If someone doesn't have anything better to do with their emblems of heroisim, now is the time to swap them out for orbs and get premium gold for them. @Gevlon: You mentioned that "With the speculant the overall orb production increased, and it's a won for everyone.". But can production for those really increase? It's not like people can run any more heroics then they do now. Given that they already did run as much as they could. The ammount of orbs one can get per day is limited by the heroics timer. One can always hve higher production for dream shards, crafting blues and disenchanting them, but it's not like you can run more then 12 heroics per day and I suppose that on average people run maximum of 4 of them. Unless by production you mean stocking all the materials before the patch and selling them after it hits. As for speculation, some of the materials were affected by this on my server while others not. Dream Shards were kinda getting slow incrase in price since few weeks, to hit yesterday twice the value from a month ago. But so high increase occured just yesterday, perhaps due to people reading US patch notes (am on EU server) and buying out all the cheap shards, so it could be that it drops a bit now. Frozen Orbs for a change haven't been affected by much lately. Since few weeks they kinda kept the same price, no increase nor decrease. But I suppose it all will change today. People don't produce Frozen Orbs. They are a side product from running heroics. Yes, you can buy them with badges but most people will want to save those for gear (now or in a future patch) so that's a minor factor. Bought a stack of 20 for around 60g each. If they do rise to 120g, should make me a nice profit. Been wondering why the prices remained at 60g. I've gotten around 11 from running instances and used one for a leg enchant. 10 frozen orbs I can't use. If everyone runs heroics, there should be 10x more frozen orbs then people can use. I agreed on the "social value" of flipping , but I cannot do it now . Do you know out of 20+ heroics i have never won a frozen orb (true fact). I cant wait as an enchanter whi has 40+ shards i will level from 412 upwards a lot quicker now. Also as an alliance player bring on the blood elf death knight alt woot. it is technically possible to run 20 heroics a week and NEVER win a frozen orb... RNG happens.. I have had runs where I win 5 in a row... and runs where I can't seem to win one to save my life. While advanced financial insterments like 'Naked Short Selling' are not practical in WoW, you can still 'short' a particular commodity. I.e. if you have been stockpiling Moonshroud/Ebonweave for crafting bags once your tailor gets that high, but you anticipate a sudden price-drop, you could sell your cloth now at a high price, then buy it back once the price drops. Shorting, i.e. Sell High, then Buy Low, is just the reverse of Buy Low, Sell High. Server population and percentage of businessmen among players plays a huge effect here. The items I stocked up before patch are: Dream Shard, Small Dream Shard, Eternal Life, Iceweb Spider Silk, Ink of the Sea. Eternal Life: 16g/30g, market flooded with posts by "Ichinafarmer"
Iceweb Spider Silk: 2g/2g, no rise in price?! It seems to me that Arthas is filled with farmers and supply is way more than demand. Guess I won't see my epic mount any time soon. Oh and, the price of Greater Cosmic Essence on Arthas went UP. What the @#$@! 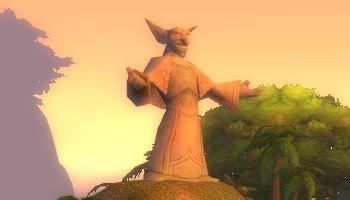 On a site devoted to the economy of WoW, especially when a brand new patch comes out, any article not pertaining to the current state of item prices, demand, etc. is worthless. I don't care who wins, as long as I win. I don't care who loses, as long as it's not me. What I need is something like Lupius: the price and demand of particular items. Mostly because I stocked up on the same things: Eternal Life, Both Epic Leg Armors, Frozen Orbs, Ink of the Sea. I sold 4 of the Eternal Lifes @ 45g, before the market got flooded. Price now in the low 20s. In order to determine the equilibrium price of Ink of the Sea, I created a tier system for selling my IotS...I would sell 5 for 50g, 5 for 55g, 5 for 60g, 5 for 65g, etc. Anything below 60g sold quickly...the 60g stacks have barely moved. However, I am the only person selling them so I can perform this experiment all day and all night. Frozen Orbs shot up, as expected. Leg armors appreciated the direct cost of a Frozen Orb, as expected. Since Frozen Orbs went up in value too, and all pants are soulbound and eventually replacable (Ulduar can't come fast enough) any inventory will eventually be exhausted, and people will be forced to make the new leg armors WITH the frozen orb components. Cha-ching! I have noticed GCE has gone up too...which just opens up how much I am willing to pay for uncommon weapon greens. Infinite Dust is also fairly high...my theory is that the drop in cloth requirement for the Imbued Frostweave is keeping Infinite Dust in high demand. Frozen Orbs staying the same or rising: Who's going to run the Heroics to farm these? Leg Armors staying the same: Price = mats + skill The new mats are here to stay. IotS: Still trying to figure this one out. As long as people are willing to gamble with getting the Nobles cards, I'm willing to sell them the ink to do it. Scratch everything I say if I return home tonight and notice that I've sold all my ink. Eternal Life: Will drop in price as IotS demand lessens. @everyone who think frozen orb cannot be created: you can buy them for badges. The fact that YOU wouldn't buy orbs for badges doesn't mean no one else wouldn't. I hope none of us grind elementals. Yet elemental fire find its way to the AH. @Ryan: no doubt that such posts are worthless for you. However many people are hesitating to start a business because they feel it's "immoral". This thread is not about Frozen Orb. It is about selling prematurely instead of selling when you have to. The real question though is: What is the perfect time to sell? The translation of this curve is to sell right after patch gets out and before the price reaches the equilibrium price. My experience will say that it depends of the product, the elasticity of it and it’s demand/supply ratio. I’d say that elastic products would follow Gevlon’s Curve whereas inelastic products would end up with an equilibrium price higher – or some times much higher - than the after patch price. 1) Supply went down (it is harder to be produced). In this scenario the equilibrium price will be higher than the after patch price because many people will have stocked many of them and when the reserves will end it will raise the price. The x product has a price of 60g. Right after patch many people that have stock up the product in order to make $$ after they will rush to sell it 120g. At this point the clueless people will try to destroy high prices and gradually drop the prices to 90g. At some point the smart people should not mislead from the clueless ones. When the clueless stocks will end or when they realize that the demand is definitely higher than it was prices will go up and up and stabilize at 150g. The real winners of this situation are neither the clueless nor the ones that rushed to sell double price right after patch. The real winners are the ones that waited the equilibrium price and sold the product on 2.5x price. The drop rate on these has gone from 10% per cast to about 90% per cast (since Tuesday's patch). Naturally, this has flooded the AH with discounted pygmy suckerfish and pygmy oil. The patch notes don't mention a change and 90% seems too high to me so I think this is a bug. I applied your advice this morning and spent about 500g on this. We'll see how it returns. PS - not sure if this applies to the "philosophy tab". I should have put it on a business post. Heya, gobbo. Love the blog, thought I'd leave a comment. It seems relatively ungoblin-like for you to be touting the virtues of speculation. It makes you gold, why do you need to explain yourself? 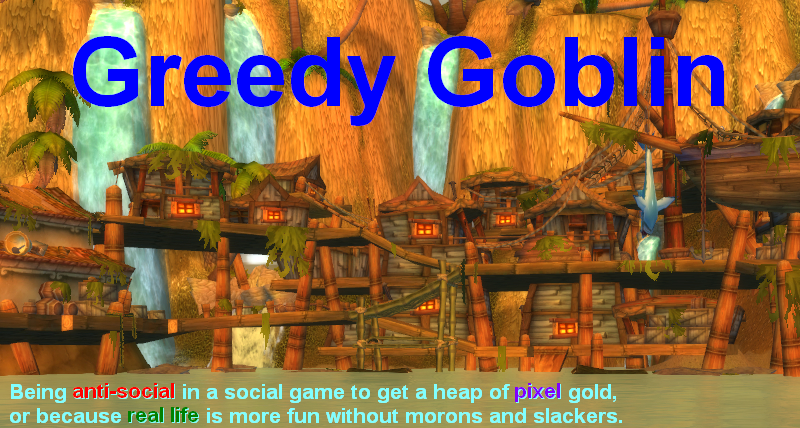 For a goblin justification lies in two things... the size of the pile of gold, or the size of the explosion. Morality is for Night Elves. On a less ironic critique of your argument... speculation is dangerous in that it ties two different utilities to the same item. First, there is the normal utility of an item, whether land, stock, or amount of virtual wealth. Then the value of the plot of land as a potential home site becomes less than the value of a plot of land as an investment. End result... land sits vacant for a period of time. Another tragic result... bubbles, as speculative utility overwhelms normal utility. Which results in over-production, diverting resources from projects that would produce more utility, just less profit. Society has an interest in profit and utility being more or less equivalent. There was a famous tax proposal in New York around 1890ish by economist Henry George that would tax the appreciation of unimproved real estate, as that was "unearned" and thus would not result in negative externalities (like people working less in the face of an income tax, or buying less with a sales tax. )He's worth reading up on. This idea gets support from weird and contradictory quarters... Milton Freidman kinda endorsed this, and the Beijing City Council in 1994(ish) adopted it. Things didn't quite work out the way I had hoped on Burning Blade. Currently the prices for Dream Shards and Frozen Orbs hasn't risen much at all, though I did note a huge flood of those mats right after the patch hit (some of them were listed as high as 5 times the old price). The leg armours didn't increase as much as I had thought either, though I have been able to get a bigger profit off of them any time I see all the cheap ones sell out. So far the only real money maker I've had has been the new Earthen Leg armours. I seem to be the only one making them (why not, I have a huge stockpile of cheap frozen orbs that I can't sell ATM).